Monday September 15 Cold & windy & not very pleasant, I found something to keep busy at part of time about house & at little jobs repairing. Ellery making preparations for leaving for "Independence" with part of rest of Co of I_N_G_, which they did first of P.M., to be gone rest of week, Lena & I took supper & spent eve along. 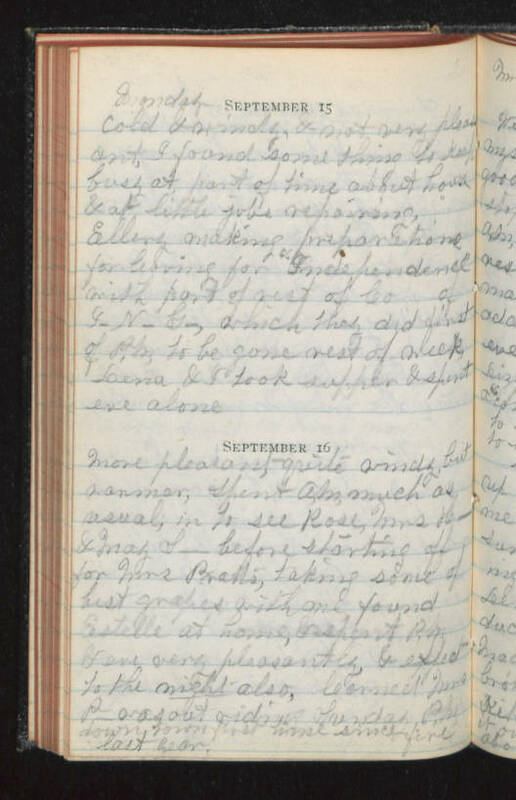 September 16 More pleasant quite windy, but warmer, spent A.M. much as usual in to see rose, Mrs H_ & May S_ before starting off for Mrs Pratts, taking some of best grapes with me, found Estelle at home, & spent P.M. & eve very pleasantly, & effect to the night also. learned Mrs P_ was out riding Sunday P.M. down town first time since fire last year.